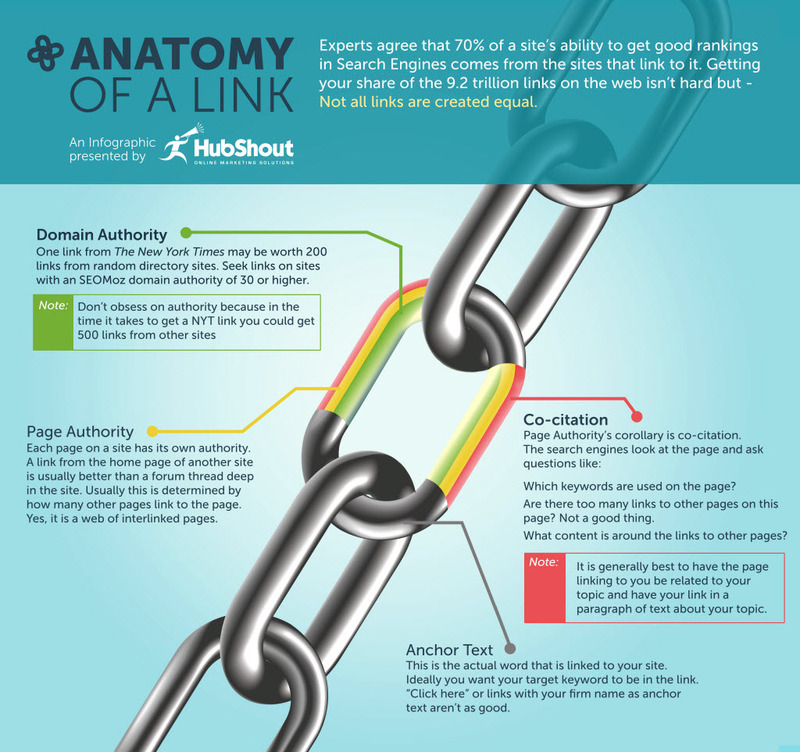 What Are Links Made Of [Infographic] | Orange County SEO Company, Inc. The basic commodity of SEO is the link. You may understand that a link is a series of letters, words, numbers or symbols that leads a searcher to a particular website. However, a link is much more than this; it is made up of many parts and serves many purposes. Dissecting a link is helpful when you want to understand the power that these piece of information have to drive traffic to your site. Understanding the anatomy of a link makes you more knowledgeable about your total advertising campaign and how links work to build your business. Site Authority. While it is obviously better to be linked to a huge and recognized web site, you may be able to build a much larger body of smaller, less important links in the same amount of time. Site authority is the “value” placed on a link by its location. Many websites start out with small, relatively unimportant links and build to linking to trusted, reputable giants. While this process may be slow, it should be the ultimate goal of your link-building campaign. In the meantime, however, take valuable smaller links when you can get them. Page Authority. Whenever possible, try to get links to another site’s homepage rather than a forum or a page considered less valuable. Each page is ranked on its own merits rather than part of the web site as a whole. This is important to consider when link building. Search engines value links based on what they link to. Linking to a homepage is often considered more valuable than linking to a promoted page or an ad. Content and Co-Authority: Google checks to see if your links to other pages relate to the topic of your content. It is a favorite trick of shady SEO to link to any available page simply to get the link working. However, Google has caught on to this technique and will devalue your links if there is not at least some connection between the page’s content and your linking page. Anchor text. You should not use your firm name as anchor text. Instead, use a word that defines the purpose of the link and the page it links to for the best search engine results. This helps users who are searching for certain keywords to find your pages and gives more value to your site. It also helps search engines understand exactly why you are linked to a particular page. This can raise your site’s overall value to the search engines and avoid the “misdirection” quandry. Orange County SEO has experts that understand the importance of links and can help you build a set of links that will attract business to your website and also help you improve your search engine rankings. Call us at Orange County SEO today to learn how we can help you build links and grow your business website quickly and effectively.